That is my opinion, how about you? How is assimilation "a dangerous word"? No one is telling people that they can't keep their cultural traditions. It becomes a problem when individual groups start demanding that our public schools follow those traditions or they demand that their workplaces accommodate their native customs. If that is done for one group, then others start demanding that it be done for their group. If a group wants their children to learn their traditions, it's up to the parents to teach them, as well as their religious institutions. For example, where we live, Koreans have created private after school programs for their kids. The kids learn to read, write and speak Korean plus learn Korean customs. This is where such programs belong---not in our public schools. There are Americans whose families go back many generations who don't go to college football games and eat hotdogs with beer. You make it sound like assimilation means forcing people to do that. It isn't. Assimilation means learning the native language and customs and adhering to them. Why move to another country and refuse to assimilate? Many see assimilation as leave your traditions at the door. That can become a problem. Very true. The biggest example is Europe and the media won't show you how bad it really is. IF someone has a better idea about how to do things, many times that'll become an "American" way of rolling. Ive seen anti Trump protests in Los Angeles where Mexican flags are flown . 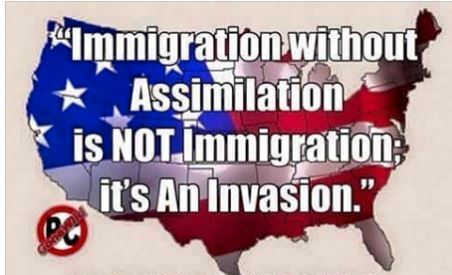 The problem is that many do not wish to assimilate instead they want to make America Mexico. I am not sure what is taught in Mexico but I am going to guess that Mexicans might be taught that the U.S. is actually their country, thus they are invading with the idea of taking it back. At many protests you can see Mexican flags and signs worded like the one below. I see Mexico trying to "colonize" the US. It needs to be stopped!